“Reality”—as a state of mind or as an embodied experience—is not a unified or universal plane; from surrealism to social networks to the “real” housewives of New Jersey, we are constantly constructing, confronting, and negotiating diverse realities. These varied and often contending sites of reality are sometimes socially accepted and sometimes labeled “alternative,” but they are always central to our sense of self and our place in the world. What, then, does it mean to locate, or dislocate, a particular kind of “reality”? What are the implications of deeming some realities alternate, or altered? What are the different realities enacted within and through, for example, cybercommunities, the space of the theater, dream states, discourses of identity politics? What are the boundaries of these realities, and what are their purposes? 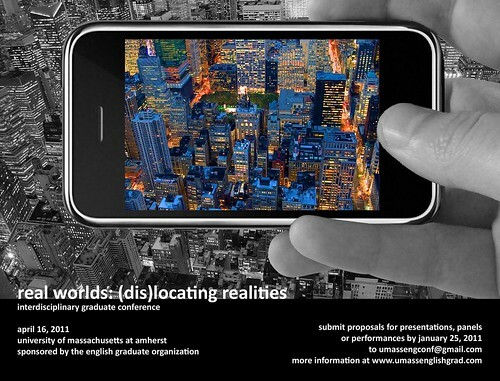 The English Graduate Organization of the University of Massachusetts Amherst invites submissions to the 2011 graduate interdisciplinary conference. This year's conference will explore multiple realities, how they are formed and demarcated, and the problems inherent in this practice. At question are states of mind, lived experiences, and subcultures that complicate or challenge traditional notions of reality and perceived states of normalcy. We urge submitters to consider the multiplicity of realities and how cultural phenomena impact our experience of those realities. We invited submissions from a diverse range of disciplines and critical perspectives. Projects include papers and/or panel presentations, performance pieces, and multi-media approaches.